Google has announced that it will be expanding its educational virtual reality Expeditions Pioneer Program with an app for classroom use. Before now, Google distributed the supplies to classrooms in a kit and collaborate with teachers on lesson plans, but now any teacher with a tablet and a virtual reality viewer can use the service. Google Cardboard, the virtual reality goggles necessary to use Expeditions, only costs around $20, and users won’t need internet access to take the virtual trips. Possible virtual field trip destinations include Buckingham Palace, Machu Picchu, the Smithsonian National Museum of Natural History, the Great Wall of China, and the Great Barrier Reef.More will be added in the months ahead, according to Adnan Farooqui of UberGizmo. The Royal Collection Trust collaborated with Google to create the Buckingham Palace Expedition. This new addition was conceptualized when London schoolchildren were asked about the place they’d most like to visit. Virtual reality is really something. It’s a gamechanger. It is entirely different. It’s the most physically immersive experience you can get without actually being at the palace. It’s not going to replace a visit, but if you are unable to get to the palace, it is the best alternative out there. One teacher used the tour of the Great Wall of China to teach fifth graders a tactile lesson in multiplication, reports Heather Hansman of Smithsonian Magazine. The same experience has been used by a 10th grade Chinese language class, a 12th grade history class, and an anthropology class at a university in Brazil. Google Cardboard allows users to fold up a flat template into a set of goggles into which they place their Android smart phones. The Expeditions Pioneer Program grew from a hackathon hosted by Google’s education department. Jen Holland, who was at that time the product manager at Google Apps for Education, combined Cardboard with Google’s archive of 3D maps and photographs. Then she created “Experiences” to serve as lessons for users. It’s a really practical application of VR and a way to use cutting edge tech for schools. We’re not just taking old tech and throwing it over the fence. We thought a lot about how this would be helpful. Now, Holland is the product manager for her creation, Expeditions. The program was announced in Spring of last year and then released in September. By November, it had been put to use by over 100,000 students. Now that number is approaching 500,000, reports Sarah Perez of Tech Crunch. 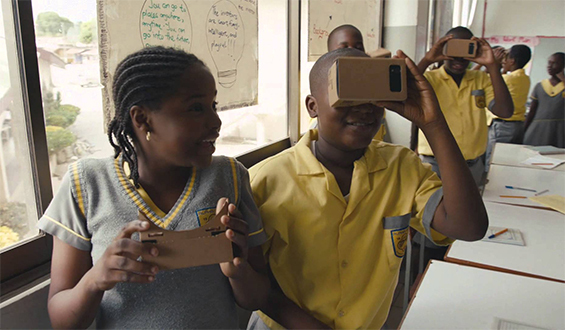 Google hopes that Expeditions and technology like it will level the playing field for those with the physical or economic inability to travel.